Are you among the 12% of the population who live with a disorder of the temporomandibular joint (TMJ disorder)? 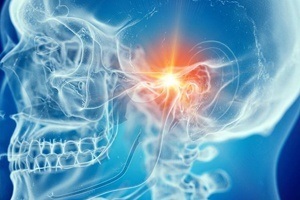 The joint is located on either side of your face to connect your jaw to your skull. It allows you to perform simple tasks, like chewing, speaking, and yawning. Unfortunately, the joint may not always function correctly, leading to a variety of issues. It is common to experience pain and limited movement of your jaw. EMA Dental can give you the relief you need with TMJ therapy in Northampton. Our team embraces the latest technologies and treatments to improve your quality of life through advanced services. Clicking, popping, or grating sensation when moving your jaw. Jaw locking in an opened or closed position. Pain, swelling, or tenderness of the jaw or face. Ringing in the ears or pain in the ears. Your dentist in Northampton performs a complete consultation to properly diagnosis the condition to stop your pain. Besides a visual exam, diagnostic images are used to assess your oral structures, including the temporomandibular joint. The information is used to create a customized treatment plan to allow your jaw to rest in a more comfortable position. If an improper bite is the cause of your symptoms, you do not need to spend months wearing braces to correct it. Instead, a minor dental procedure can be used to reshape the biting surfaces of your molars. Advanced technology and an impression locate the areas that need to be adjusted for precise results. A fine polishing brush removes small amounts of enamel to allow your jaw to rest in a more natural position. The relieves pressure off your jaw to alleviate your symptoms. You can stop your jaw pain using a noninvasive solution with an occlusal splint. It has an appearance similar to a mouthguard, but it serves a different purpose. The acrylic resin material is custom-made to move your jaw into a more comfortable position. Over time, your jaw is trained to rest naturally in that position for permanent relief from your pain. Besides realigning your jaw, the appliance also acts as a protective barrier between your top and bottom teeth. This makes it the ideal solution for those who grind or clench their teeth. It not only stops your pain but also protects your teeth from damage to save your smile. You do not need to live with difficulty speaking or chewing your favorite foods. EMA Dental can give you the relief you need with TMJ therapy. We create the customized solutions you need. Contact our office today to schedule your consultation.